Rat No. 786. Initiated on on 21 August 1994. Robert Wentworth John Holness was born in Vrijheid, Northern Natal, South Africa. His Grandfather had fought in the South African wars and settled there as a mining engineer. Bob's father also enjoyed living in the country and had many contacts with the Zulu people. When Bob was seven the family returned to England and settled in Kent where young Bob won a scholarship to the Ashford Grammar School, now the Norton Knatchbull School. Bob recalled that during the second world war he and his schoolmates 'cycled all over Kent souvenir hunting for shrapnel from wrecked planes' After Ashford Grammar School and the Maidstone College of Art he was persuaded by his father to become a printing apprentice. But he hankered after a career on the stage. When his family returned to South Africa Bob took a printing job but gave it up after only two months to join a British repertory company in Durban. Eighteen months later he was working with the South African Broadcasting Corporation as a radio actor. In the 1950's, he was only the second actor to play the part of James Bond; this was in a radio adaptation of 'The Moonraker'. It was during his time at the S.A.B.C. that Bob & Mary, an actress, met and married. After the birth of their second daughter the family decided to return to England so the girls could have an English education. It took a few years to save up enough money to buy the tickets. However, in 1961 they arrived at Southampton with 'hardly a bean' in their pockets. They stayed with Mary's family in London whilst Bob looked for work. Within three weeks Bob was put under contract by Granada in Manchester. His first introduction to British TV was on the shows 'Take A Letter' and 'Junior Criss Cross Quiz' an embryonic form of 'Blockbusters'. He was also being used as a continuity announcer and newsreader. He stayed with Granada for three years when he moved down South where he and Mary purchased a house in Pinner. This remained the family home for more than the next three decades. Over the years, he worked as a reporter, interviewer and announcer for such TV programmes as 'World In Action' and 'Today' and radio shows including 'Late Night Extra'. He delivered LBC radio?s traffic reports from a helicopter. For many years he and Douglas Cameron co-hosted LBC's morning news show 'A.M. ', which required a 3.30am start to his day. Bob had a long association with BBC Radio 2 and also the BBC World Radio Service, for which he presented 'Anything Goes'. However, it was 'Blockbusters' that made Bob a national favourite. The show ran from 1982 to 1994, attracting at its peak 11.5 million viewers. It was screened by Sky for a further year during 1995. 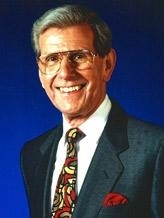 Bob then succeeded Robert Robinson as Chairman of 'Call My Bluff'. This was followed by 'Raise The Roof'. Bob lent his support to a great number of children's charities including Teenage Cancer Trust, Young People's Trust for the Environment and as president from 1994 of the National Children's Home (now Action for Children). During the last few years Bob suffered a number of minor strokes. He is survived by his beloved wife, Mary, and their three children Carol, Rosalind and Jonathan and their seven Grandchildren.